Bluegrass IIBA Chapter - Bluegrass IIBA - Why Do Business Analysis, Really? Bluegrass IIBA - Why Do Business Analysis, Really? For members in good standing of Bluegrass IIBA Chapter, and Annual Passholders. We encourage online registration to our events; therefore, this preregistration type will expire 24 hours prior to the event and member registration will be $10 within 24 hours of the event. 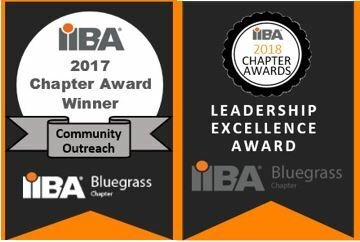 For members in good standing of Bluegrass IIBA Chapter, and Annual Passholders. We appreciate and encourage online registration prior to the day of the event; therefore, this member registration is $10 now and at the door. For state government associates to visit a regular meeting of the chapter to experience the networking, community and professional development opportunity we have to offer. Why Do Business Analysis, Really? The purpose of business analysis is supposedly to define a future that will allow an organization to achieve specific goals and objectives. In reality, the purpose of business analysis can be anything from mindlessly scribbling down “requirements” to predicting the future of the known universe. Although often married to IT (Information Technology), business analysis is a fundamental business process regardless which organizational unit performs it. Because it defines the interface between people and technology, it is by nature complex. Based on experience gained in working with hundreds of organizations of various sizes world-wide, we identify distinct differences in business analysis as practiced at three levels. In a nutshell, Strategic Business Analysis identifies opportunities for improvement. Tactical Business Analysis flushes out the details of defined projects or initiatives. Operational Business Analysis deals with the evolving daily changes in the life of any change process. Defined thusly, these could be three different careers although they share a great deal of common techniques. As the business analyst, you need to be aware of the level at which you are working to morph the techniques for maximum returns. Tom has over 30 years of experience as a practitioner and instructor in the information technology and business analysis fields. Despite his developer background, he recognized early in the 1980’s that the business community needed to define business requirements as the basis for system development. He has developed and presented business analysis training and consulting services to a world-wide audience of IT and business professionals. Working closely with his wife and business partner Angela, he created and maintains a business analysis blog and YouTube channel with nearly 1 million views and 12,000 subscribers. Together, they have recorded and published over 30 free “KnowledgeKnuggets™” explaining specific business analysis techniques for “Anyone Wearing the BA Hat”. In addition, they have written and published 7 Business Analysis books (available on Amazon.com) with related video courses (available on Udemy.com) and have more planned.